With a shower curtain, you won't flood your bathroom every time you shower! Dorm Co. Tip: Don't forget to include hooks with your shower curtain! Is your dorm room going to be a suite style dorm room with a private dorm bathroom? 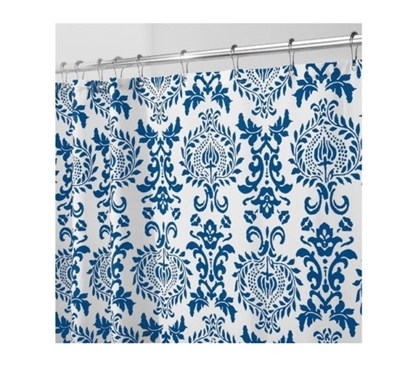 You're going to need our Damask Navy Fabric Shower Curtain! Unless you want to keep that bland dorm shower curtain in your dorm shower that the University will provide. If the University provides a shower curtain for that dorm bathroom, that is. Whether they provide a dorm shower curtain or not, you're going to want a dorm shower curtain to add some dorm room decor to that dorm bathroom! Unless you want puddles on the floor, of course, but that would just mean you and your roommates mopping every time you shower so we highly recommend our Damask Navy Fabric Shower Curtain! When you have your own dorm bathroom you can make it as pretty as you make your dorm room! A pretty dorm room decor for your dorm bathroom starts with your dorm shower curtain. Our Damask Navy Fabric Shower Curtain features a beautiful intricate blue pattern on a white backdrop. Yes, dorm shower curtains can be pretty and our Damask Navy Fabric Shower Curtain proves it! This dorm essential dorm shower curtain is made of fabric which adds a nice touch your dorm bathroom instead of just a plastic dorm shower curtain. Don't settle for keeping that bland dorm shower curtain the University provided you with - instead start your morning with beautiful bright colors on your college supplies!